For thousands of years, people only had natural fibers to care for and use. But with the explosion of manufactured fibers, blends, and finishes after World War II came confusion. Manufacturers gave their own products trade names that meant very little to consumers. A real need for more information was provided in the form of a series of labeling laws. In its natural state, silk has a gummy feel, and it is usual practice to remove the gum. In so doing, however, the weight of the silk is greatly reduced. To counter that loss, in the late nineteenth century, manufacturers began the weighting of silk to counteract the weight lost by degumming raw silk. Silk was subjected to metallic salts, which could be absorbed in quantities greater than the weight of the silk itself. While the immediate result was a fabric with a heavier hand, the long-term effect was to create a fabric that tended to split into shreds. Since the consumer had no way of discerning this, the U.S. Federal Trade Commission (FTC) ruled in 1938 that silk weighted more than 10 percent and black silk weighted more than 15 percent must be labeled Weighted Silk While this ruling remained in effect in the early twenty-first century, few silk items were weighted by then. According to this act, most products that contain any amount of wool must be labeled by the name of the wool source and percentage weight, even if it is less than 5 percent. They must distinguish between wool (also known as "virgin wool" and "new wool") and recycled wool, wool from a textile product that has been returned to a fibrous state and remade into a different product. The manufacturer's name or number registered with the FTC must be on the label as well as (since 1984) the country of origin. Some products, such as hats and slippers that contain some wool, must be labeled under this labeling act even though they are exempt under the Textile Fiber Products Identification Act (TFPIA). The following items, when made of wool, are exempt from the provisions of this act: carpets, rugs, mats (though these are covered by the TFPIA), upholsteries, and wool products destined for export. In the early days of this act, the FTC assigned Wool Products Labeling (WPL) numbers to particular manufacturers or retailers of wool. Since each company would retain its number forever and some manufacturers have changed their products' fiber content from wool to such nonwool fiber as polyester, some nonwool products have a WPL number. Fur fibers that have been removed from the animal's skin are subject to the rules set forth in the Wool Products Labeling Act and the TFPIA. Labeling of fur fibers attached to the skin is regulated by the Fur Products Labeling Act. The labels must contain the animal's species and may include the adjective form of the country (such as Russian Mink or Canadian Fisher). Labels must also provide the name or registered number (RN or WPL) of the manufacturer, importer, or other distributor. The country of origin must be given. If the fur has been colored, pointed, or bleached, the label must state this. If the fur has not been so treated, it should be labeled as Natural. The original act banned the use of highly flammable materials for clothing. In 1967, the law was amended to include highly flammable household textiles. Further amendments have banned the use of all flammable materials for carpets, draperies, mattresses, upholstery, and children's sleepwear (sizes 0-14). Standards for each of these products may be found on the Web site of the Federal Trade Commission ( http://www.ftc.gov). The TFPIA requires that the name of the fibers (natural, such as cotton, or the generic name for manufactured fibers, such as nylon) be listed in descending order by percent weight of the total. If fibers are present in quantities of less than 5 percent, they should be listed as other fiber(s). If several fibers constitute less than 5 percent each, they should be combined and listed as other fibers, even if their combined total is greater than 5 percent. Two exceptions exist: because of the Wool Products Labeling Act, all products containing wool must be listed, even if the percentage is less than 5 percent. Also, those products that provide a definite functional property in amounts of less than 5 percent may be listed as such without explaining what the functional significance is. Small amounts of spandex lend a good deal of stretch to a garment, for example. Pile fabrics can list fibers by total weight only. 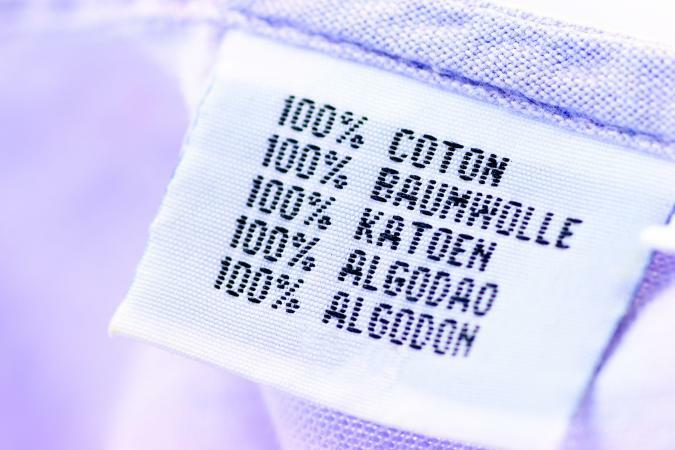 However, if a label lists fibers as 100% nylon pile, 100% cotton back, the label must also add the fibers by weight: 60% cotton, 40% nylon; in other words, the back is 60 percent of the fabric and the pile is 40 percent. Those fibers composed of two or more chemically distinct fibers must be listed as biconstituent or multiconstituent. The manufacturer's name or registered identification number (RN or WPL) must be given. Consumers can find out the name of the company by going to the FTC Web site ( http://www.ftc.gov), clicking on Business Guidance, and then RN Lookup Service. The country of origin must be listed. Products made entirely in the United States of materials from the United States must be labeled Made in USA. Products made in the United States of imported materials must be labeled as such: Made in USA of Imported Fabric. The country name for imported items must be written in English, but may be written in additional languages as well. The country of origin information must always be on the front of the label. All of the required fiber information may be put on one tag or several as long as the information is legible, conspicuous, and accessible to the consumer. All content information must be in the same size print. Other extraneous information may be included on the fiber label as long as it is not misleading to the consumer. The Care Labeling Rule of 1972 set down very specific requirements for manufacturers and importers to follow. In 1984, the rule was amended to provide a Glossary of Standard Terms. In 1999, the American Society for Testing and Materials developed care symbols intended to be understandable around the world, despite language differences. In 2000, the Care Labeling Rule was amended again. In the early 2000s the rule requires that care instruction apply to the entire garment. 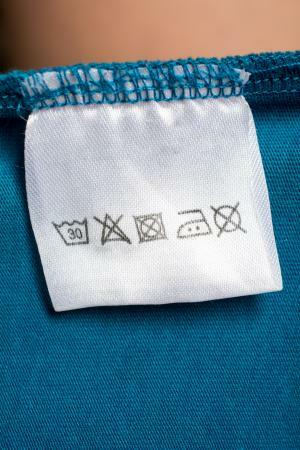 According to the Care Labeling Rule, textile clothing and piece goods (fabric sold to home sewers) must carry a care label outlining safe cleaning procedures. 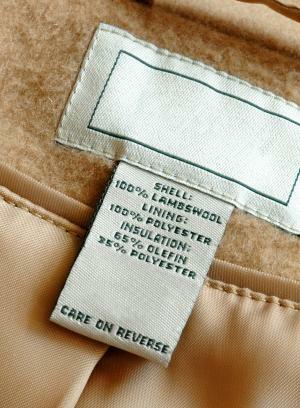 In the case of clothing, a care label should be sewn into the garment and be easily viewed at the time of purchase. It should remain legible for the lifetime of the garment. For completely reversible garments with no pockets and for other garments where a label would ruin their appearance (such as a sheer blouse), care information may be put on a hang tag. For clothing sold to institutions such as hospitals, no label is needed, but care instructions must be given to the institution at the time of purchase. Textiles that can be cleaned safely in several ways are required to list only one method. For items that can be cleaned by the harshest methods, the label should read, Wash or Dry Clean, Any Normal Method. This means that the item could safely be machine-washed in hot water, bleached with any bleach, tumble-dried hot, and ironed at a hot setting. It also means that the item could be drycleaned using any solvent. For items that cannot be safely cleaned by any means, the label should read, Do Not Wash-Do Not Dry Clean. Washing. The label must say if hand-washing or machine-washing is recommended. Also, unless the product can be washed in hot water, a temperature must be specified. Bleaching. If any available bleach can be used without harm, the label need not mention bleach. If chlorine bleach would damage the product, the label must say, Only Non-Chlorine Bleach, When Needed. Drying. The label must indicate how the product should be dried: tumble dry, dry flat, or drip dry. If the product cannot be machine-dried at the hottest setting, then the proper temperature must be stated. Ironing. Ironing information is required if ironing will be needed on a regular basis. If ironing cannot be done at the hottest setting, a proper temperature must be specified. Warnings. Special warnings must be given if a consumer might reasonably use a care procedure that would result in damage. A delicate garment suitable for hand-washing might need a Do Not Wring warning. Products that might damage other items washed with them might need warnings such as Wash Separately or Wash with Like Colors. Warnings do not need to be used for alternative care procedures. If the label reads, Machine Wash Cold, it need not use the warning Do Not Wash in Hot Water. If garments can be safely dry cleaned with any solvent and there are no special conditions that require warnings, then the label may say, Dry Clean Only. These garments can be put in a dry-cleaning machine by the consumer at a Laundromat or given to a professional dry cleaner. When a warning is needed, it should be stated after the words Professionally Dry Clean. For example, if steam would cause damage, the label should read, Professionally Dry Clean-No Steam. See also Dry Cleaning; Fibers; Fur; Silk; Wool. Collier, Billie J., and Phyllis G. Tortora. Understanding Textiles. 6th ed. Upper Saddle River, N.J.: Prentice-Hall, 2000. Humphries, Mary. Fabric Reference. 3rd edition. Upper Saddle River, N.J.: Prentice Hall, Pearson Education, 2004. "Care Labeling of Textile Wearing Apparel and Certain Piece Goods, as Amended, Effective September 1, 2000." U.S. Federal Trade Commission. Available from http://ftc.gov/os/statutes/textile/carelbl.htm . "Clothes Captioning: Complying with the Care Labeling Rule." U.S. Federal Trade Commission. Available from http://business.ftc.gov/documents/bus50-clothes-captioning-complying-care-labeling-rule%20 . "Threading Your Way through the Labeling Requirements under the Textile and Wool Acts." U.S. Federal Trade Commission. Available from http://business.ftc.gov/documents/bus21-threading-your-way-through-labeling-requirements-under-textile-and-wool-acts.